While helping to sort through some of my recently deceased great-aunt’s belongings the other day, I came across a notebook into which she (or another member of her family) had pasted each week a newspaper cartoon-column by Peter Jackson entitled London is Stranger than Fiction. The cartoons were published in 1949 and 1950 and contain sufficient fascinating facts and amusing anecdotes to keep me happy for years! 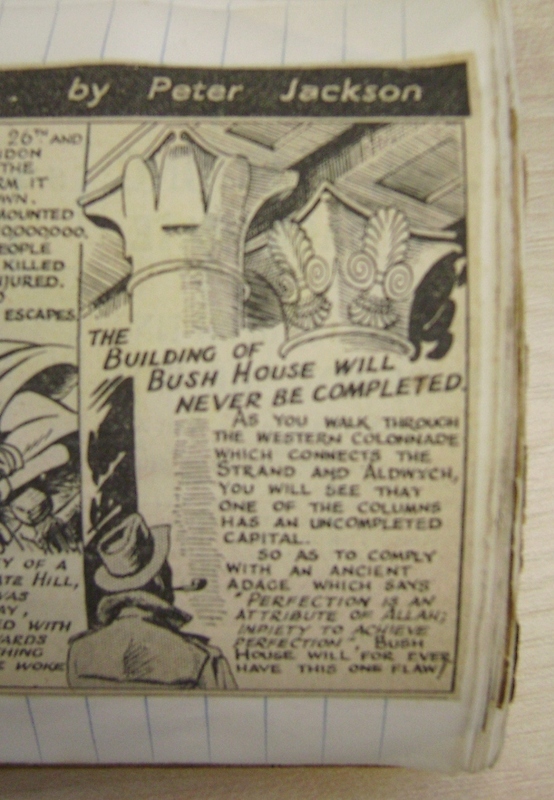 “The building of Bush House will never be completed. As you walk through the western colonnade which connects the Strand and Aldwych, you will see that one of the columns has an uncompleted capital. This sounds at first like an act of great humility, acknowledging before God our imperfection and glorifying his perfection. In fact, though, it does completely the opposite – it assumes that we humans actually could ever achieve perfection. What astounding arrogance! The idea that even one person could ever make something truly perfect is far-fetched enough; the concept that all the dozens, if not hundreds of people involved in the design, construction and decoration of a huge building could cooperate sufficiently to produce something perfect is naive to say the least. These people actually believed they could achieve perfection. They thought if they didn’t introduce some artificial flaw, they would have created something so perfect it would be a challenge and an affront to God. They had become, in fact, like gods in their own eyes. The people in this passage wanted and intended to be like gods. They planned to use a building to show how great and powerful they were. The builders of Bush House, however, went a step further – they already believed they were like gods. Their building wasn’t designed to demonstrate their supremacy, but was deliberately flawed so God wouldn’t feel embarrassed on seeing their supremacy. True humility rests in knowing our imperfections, but offering our very best to God anyway. It seeks to honour him, not by seeking to avoid superseding him, but by acknowledging how poor a shadow even our best efforts are of his smallest works. Humility is what happens when our truthful assessment of our own worth meets the astounding revelation of the value God sees in us. It’s something our world could do with a little more of. Who better to model it to them than the redeemed? When better to start than today? I don’t think I would ever have looked at it that way. Jen, that’s the best blog ever! Oops, no, it can’t be. Now where’s the flaw?